Subjects, styles, advertising, other relevant information: wedding, portrait, social and animal, copying old photographs. Neville began his photographic career in the army- by the end of his national service he had taken some 36,000 photos for an army identity card scheme. After leaving the army he worked for many years as a design draughtsman, becoming a professional photographer when that job came to an end. His studio was a converted garage at his home and he was assisted in the business by his wife. He favoured a medium format Mamiya C330 camera. 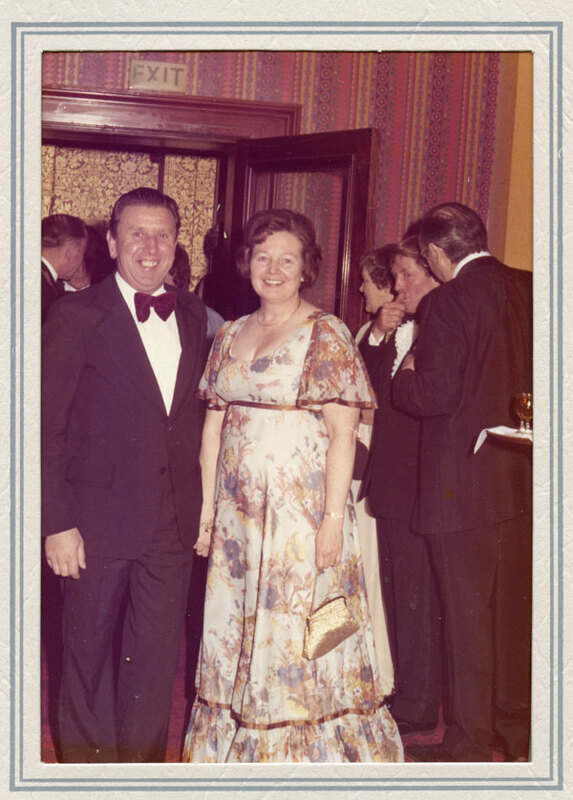 Below is a portrait of a couple in evening dress, probably taken at the University Arms Hotel, Cambridge, rather poorly complosed and slightly soft focus. The 7in x 5in coloured print is in a cream card wrap-round mount with an Abel Label on the reverse with "Neville Atkinson, 20 High Green Great Shelford, Cambridge CB25EG Tel Shelford 3380" printed thereon. The telephone number puts this in the 1980s. 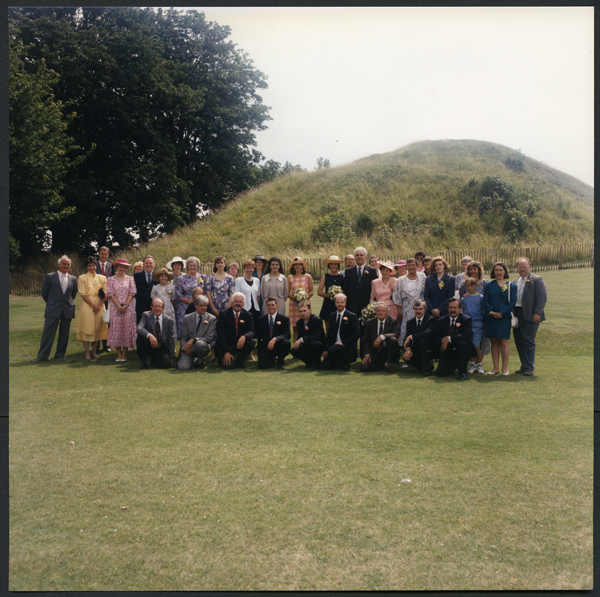 The example print below is an 8in x 8in colour proof of a wedding group taken at the Shire Hall Cambridge by Neville Atkinson in 1992. There are no identifying photographer's stamps on the proof, which was printed on Kodak paper. The clients were unimpressed with the proofs and ordered no prints. References: Cambridge Yellow Pages 1982, 1983, 1984, 1990, 1995. Cambridge Evening News 15 Feb 1984. Name: AUSTIN, (Walter) Frank b. 1874 Faringdon Berkshire d.
Subjects, styles, advertising, other relevant information: Walter Frank Austin was the son of a game keeper and in 1891 he worked as an under-keeper, living with his parents at Paley Street, White Waltham, Berkshire. In 1899 Walter married Sarah Nee Gales,b: 1871, March Cambridgeshire at North Witchford, and in 1901 he was living at 74 Bullingdon Road, Oxford, his occupation then being a builders' manager. In 1906 Walter Frank Austin, Burrowmoor Road, March, Cambs submitted to Stationers'Hall for copyright purposes a photograph of the children, staff, education committee & local managers attending opening of the New South District Schools, March. Copyright owner of work and copyright author of work: Walter Frank Austin, Burrowmoor Road, March, Cambs. Form completed: 12 November 1906 (TNA COPY 1//503/230). By the time of the 1911 census Walter Frank Austin was living at Greystoke, March with his wife and two young daughters and his occupation was Rate Collector for the Guardians at Witchford Union. It would seem that photography was a secondary occupation. Frank Austin, Broad Street, March, is listed as a photographer in just one directory - Kellys Cambridgeshire Directory 1912. According to Rouse, Frank Austin took a number of photographs of local views for postcards published by E.C.Harlock, bookseller and stationer. Nick Smith has identified similar painted backdrops of a window and wooden panelling, used in portraits by Frank Austin and by Clement Gwynne, suggesting that Gwynne took over Austin's Broad Street Studio business. The advertisement below, kindly provided by Nick Smith, is from a 1911 Coronation Programme from March, and shows that Austin attended the studio every Tuesday, or by appointment, confirming that the photographic business was only one of Austin's occupations. 1911 Coronation Programme, March Cambridgeshire. Subjects, styles, advertising, other relevant information: James Austin was the son of a Cambridge Professor, and studied History of Art at Cambridge, followed by postgrad work at the Courtauld Institute. His career really started in the 1960s when, in his 20s, he took a 500 mile cycle ride in France taking photographs. He became a fine art and architectural photographer of international repute. Awarded a Fellowship of the Institute of Incorporated Photographers. In 1987 he was coming to the end of a 3 year contract photographing the Sainsbury Art Collection. His illustrations have been used in Pevsner's "The Buildings of England". The Paul Getty Foundation of America bought 10,000 of his images as a source of reliable research material. References: See the Wikipedia entry for James Austin https://en.wikipedia.org/wiki/James_Austin_%28photographer%29 Cambridge Yellow Pages 1980, 1981, 1982, 1983, 1984, 1985, 1990, 1995, 1997, 1998, 2000. Cambridge Evening News 27 Dec 1979 gives a list of those in Cambridge who over time had received Fellowships of the Institute of Incorporated Photographers - (NB this was not the year in which these were awarded). Cambridge Evening News 26 Nov 1987. Subjects, styles, advertising, other relevant information: Photographic trade printers and photographers, specialising in real photo postcards. Run initially by father and two sons, Joseph Whitman (1875-1951), Joseph Charles Whitman (1900-1980) and Leslie William Whitman (1910-1995). Produced batches of postcards, mainly for local post offices. One of the brothers took many of the photos used for the postcards. The firm operated Graber presses (These were made by Ellis Graber in Tunbridge Wells from around 1910 to the 1940s - described as "automatic exposing, type-printing, and cutting machine that printed text and photograph on rolls of postcard paper and then cut them into individual postcards. As we were American photographic postcards 1905-1930 by Rosamund B Vaule.). The company was bought up by Campkins in 1967. For a while, from around 1975, they had a substantial number of Francis Frith negatives from which they produced postcards. Earlier in his career, Joseph Whitman was also a director of The AERIAL PHOTO CO (Peterborough) Ltd in 1927, along with John Borrill Etches, see above. In the 1939 Register Joseph C Whitman was shown as a photographic trade printer living at 19 Grange Road, Peterborough with his wife Emma b: 1903. His brother Leslie, same occupation, was at 24 Grange Road Peterborough with wife Rose b:1912 and his in-laws. Graces Guide has a page for Ellis Graber and a number of their trade adverts. 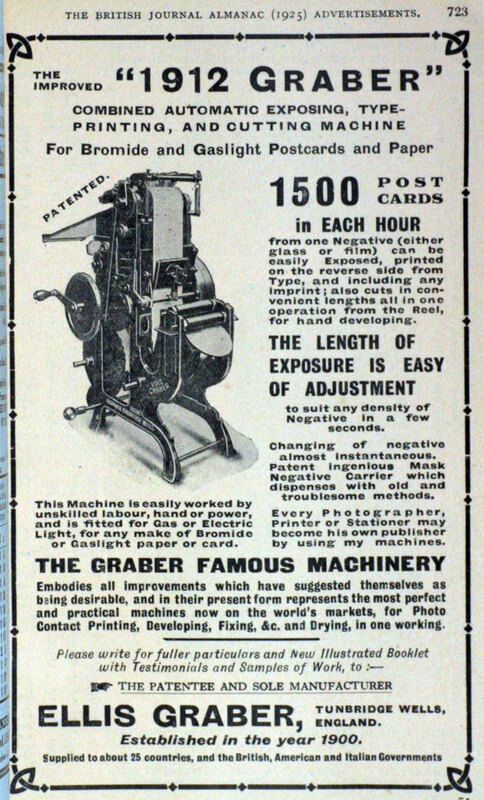 This link: https://www.gracesguide.co.uk/images/2/23/Im1925BJPA-Graber723.jpg will take you to an advert for their 1912 Graber Patent Automatic Photographic Exposing, Type-Printing and Cutting Machine, capable of turning out 1500 postcards in an hour.